The idea that space is a container and objects or physical bodies reside in this container is an illusion that results from our spiritual sleep. In fact, the universe is a higher-dimensional field where vortical entities are both separated and interconnected. Scientists have established that every massive entity curves spacetime. 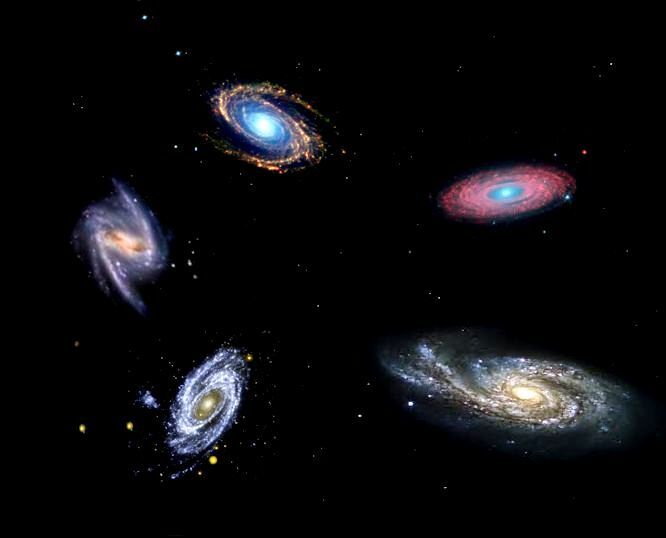 Thus, when we observe the vortical galaxies in the image above, we notice that, although each galaxy is independent, it is still interconnected with other galaxies as well as part of the unified field. In fact, these vortical galaxies were formed from the unified field by involution and evolution, vorticity or curvature. And their very substance originates from and is still sustained by the unified field. Now, scientists also believe that the Big Bang or original state of the universe was a singularity. A singularity is where gravity is infinite. Thus, we can infer from this that the universe originated from the Infinite and was produced from higher dimensions by involution and evolution. In mathematics, an involution is a function that is its own inverse. In projective geometry, an involution is a transformation that is synonymous with harmonic reflection. Hence, we can conclude that the Infinite (or God) created the universe as a reflected image of Himself. The process of the universe is the self-reflection of the Infinite (or God). And God must be at the center of this immense higher-dimensional vortex and at the infinite extremities. Moreover, the purpose of the universe must be to perfectly reflect the image of the Infinite (or God). Scientists also tell us that the process of the universe or God’s harmonic reflection has been going on for billions of years. The best estimate so far is about 14 billion years since the Big Bang. What does this mean? And what is time anyway? Time in fact is a cycle of reflection. We also notice that nothing is static in the universe. Every vortical entity is curving or returning into the fourth dimension of its time. Our involution and evolution is our emergence from the unified higher-dimensional field and our return into it. Our own lifetime is about eighty years. The lifetime of elementary particles is infinitesimal. But the lifetime of stars and galaxies can range in billions of years. It also took billions of years for the human species to evolve. And, if the process of the universe is the harmonic reflection of God, humanity must be this reflected image. It is presently not a perfect image but it is still a reflection or image. It will probably take many more years of involution and evolution before this image becomes perfected. Therefore, the human structure is a higher-dimensional vortex because the universe is also a higher-dimensional vortex. And, in fact, we can uncover the nature of dimensions that are beyond time by studying man. Beyond his four-dimensional lifetime, man also has a mind that thinks and a will that feels and loves. And, if man is the image of God, the fifth dimension of the universe must be harmonic mind or Truth and its sixth dimension must be harmonic will or Divine Love. Thus, the Infinite must have created the universe and human beings to realize Love. And this love is fully realized when man understands Truth and reciprocates Love. God must be at the center of every vortical being through Love. Our own love (or will) is a free gift of God’s own substance that we can freely choose to reciprocate from gratitude. If there were not one God the universe could not have been created or maintained. We can infer the oneness of God from the creation of the universe, because the universe is a work connected together as one thing from beginning to end, all dependent on one God as the body depends on its soul. The universe was designed to allow God to be omnipresent, keep every detail of it under his supervision, and maintain it perpetually as one entity, that is, preserve it. This is why Jehovah God says he is "the First and the Last, the Beginning and the End, the Alpha and the Omega" (see Isaiah 44:6; Revelation 1:8, 17); and why he says elsewhere that he makes all things, stretches out the heavens, and extends the earth by himself (see Isaiah 44:24). This vast system called the universe is a work connected as one thing from beginning to end because God had a single purpose in creating it: an angelic heaven populated by the human race. All the things that make up the world are means of fulfilling that purpose, because someone who intends an end result also intends the means to achieve it. If we view this world as a work containing the means of fulfilling the aforementioned purpose, we can see the created universe as a work connected together into one thing; and see that this world is a complex structure of useful functions arranged and prioritized for the sake of the human race, the source of the angelic heaven. Divine love cannot intend anything other than that people should forever have the blessings of its divineness. Divine wisdom cannot produce anything other than useful things that are means of fulfilling that purpose. Upon examining the world with this universal idea in mind, every wise person is capable of grasping that there is one Creator of the universe and that his essence is love and wisdom. For this reason every single thing in this world is of benefit to us; if it seems of no direct benefit, at least it is of indirect benefit. The fruits of the earth and the animals benefit us with food and also with clothing. Among the marvels of this world is that the lowly insects called silkworms clothe with silk and magnificently adorn both women and men from queens and kings down to maids and butlers. And the lowly insects called bees supply wax for the lamps that give churches and royal courts their splendor. Everything in the universe was created by the divine love and wisdom of the Divine-Human One. The universe, from beginning to end and from first to last, is so full of divine love and wisdom that you could call it divine love and wisdom in an image. This is clearly evidenced by the way everything in the universe answers to something in us. Every single thing that comes to light in the created universe has such an equivalence with every single thing in us that you could call us a kind of universe as well. There is a correspondence of our affective side and its consequent thought with everything in the animal kingdom, a correspondence of our volitional side and its consequent discernment with everything in the plant kingdom, and a correspondence of our outermost life with everything in the mineral kingdom. This kind of correspondence is not apparent to anyone in our physical world, but it is apparent to observant people in the spiritual world. We find in this latter world all the things that occur in the three kingdoms of our physical world, and they reflect the feelings and thoughts of the people who are there--the feelings that come from their volition and the thoughts that come from their discernment--as well as the outermost aspects of their life. Both their feelings and their thoughts are visible around them looking much like the things we see in the created universe, though we see them in less perfect representations. From this it is obvious to angels that the created universe is an image depicting the Divine-Human One and that it is his love and wisdom that are presented, in image, in the universe. It is not that the created universe is the Divine-Human One: rather, it comes from him; for nothing whatever in the universe is intrinsic substance and form or intrinsic life or intrinsic love and wisdom. We are not "intrinsic persons." It all comes from God, who is the intrinsic person, the intrinsic wisdom and love, and the intrinsic form and substance. Whatever has intrinsic existence is uncreated and infinite; while what comes from it, possessing nothing within itself that has intrinsic existence, is created and finite. This latter presents an image of the One from whom it derives its existence and manifestation. Created, finite things may be said to have reality and manifestation, substance and form, life, and even love and wisdom, but all of these are created and finite. The reason we can say they have these attributes is not that they possess any divinity but that they are in Divinity and there is Divinity in them. Anything that has been created is intrinsically without soul and dead, but it is given a soul and brought to life by the presence of Divinity in it, and by its dwelling in Divinity. The divine nature is not different in one subject than it is in another. Rather, one created subject is different from another: there are no two alike, so each vessel is different. This is why the divine nature seems to differ in appearance. I will be talking later about its presence in opposites. Everything in the created universe is a vessel for the divine love and wisdom of the Divine-Human One. We acknowledge that everything in the universe, great and small, has been created by God. That is why the universe and absolutely everything in it is called "the work of Jehovah's hands" in the Word. People do say that the whole world was created out of nothing, and they like to think of "nothing" as absolutely nothing. However, nothing comes from "absolutely nothing" and nothing can. This is an abiding truth. This means that the universe, being an image of God and therefore full of God, could be created by God only in God. God is reality itself, and everything that exists must come from that reality. To speak of creating something that exists from a "nothing" that does not exist is a plain contradiction of terms. Still, what is created by God in God is not a continuation of him, since God is intrinsic reality and there is no trace of intrinsic reality in anything created. If there were any intrinsic reality in a created being, it would be a continuation of God, and any continuation of God is God. The angelic concept involved is that anything created by God in God is like something within ourselves that we have put forth from our life, but the life is then withdrawn from it. It then agrees with our life, but still, it is not our life. In support of this, angels cite many things that happen in their heaven, where they say that they are in God and that God is in them, and yet that they have in their being no trace of God that is actually God. This may serve simply as information; more of the angels' evidence will be offered later. Everything created from this source is in its own nature suited to be receptive of God not by continuity but by contact [contiguity]. Union comes through contact [contiguity], not through continuity. What is created is suitable for this contact because it has been created by God in God. Because it has been created in this way, it is an analog; and because of the union, it is like an image of God in a mirror. 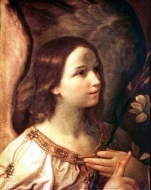 This is why angels are not angels in their own right but are angels by virtue of their union with the Divine-Human One; and their union depends on their acceptance of what is divinely good and what is divinely true. What is divinely good and what is divinely true are God, and seem to emanate from him even though they are within him. Their acceptance depends on the way angels apply the laws of his design, which are divine truths, to themselves, using their freedom to think and intend according to their reason, a freedom given them by God as their own possession. This is what enables them to accept what is divinely good and divinely true in apparent autonomy; and this in turn is what makes possible the mutual element in their love, for as already noted, love is not real unless it is mutual. It is the same with us here on earth. All this enables us finally to see that everything in the created universe is a vessel for the divine love and wisdom of the Divine-Human One.